Action Pest Control encourages public awareness during Bed Bug Awareness Week. Since making a resurgence several years ago, bed bugs have proven to be a difficult and hard to treat pest, infesting homes and hotels, retail locations and even places of employment. Although a year-round concern, experts from the National Pest Management Association (NPMA) want people to be on high alert prior to heading into the busy summer travel season, declaring April 20th the start of Bed Bug Awareness Week. In recognition of the observance, Action Pest Control is advising people in Indiana, Kentucky, and Illinois to be extra vigilant to help curb the spread of this blood-sucking pest. Public vigilance can start with careful inspections upon check in at lodging accommodations. According to 2013 research by the NPMA and the University of Kentucky, 75 percent of pest control professionals indicated that they have encountered infestations of bed bugs in hotels and motels in the past year. Hotels are taking a proactive stance on protecting their establishments from bed bugs with strict protocols that include routine inspections, but guests also play an important role in bringing bed bugs to management’s attention and to help limit the spread of bed bugs to other locations. At hotels, thoroughly inspect the entire room before unpacking, including behind the headboard and in furniture. Pull back the bed sheets and check the mattress seams and box springs for pepper-like stains that may be evidence of bed bug activity. If you suspect an infestation or problem, notify management and change rooms immediately. Be sure the new room is not adjacent to or directly below or above the possibly infested room. Keep suitcases in plastic trash bags or protective covers during a hotel stay to prevent bed bugs from nesting there. Do not put them on the beds. Upon returning home from a trip, inspect all suitcases and other belongings before bringing them into the house. Wash all clothes - even those that have not been worn - in hot water and dry them using an extra-hot dryer setting. For more information on bed bugs, please visit http://www.actionpest.com. Action Pest Control is the largest independent pest control company in Indiana and Kentucky. With seven branches throughout Indiana, Kentucky, and Illinois, they serve residential, commercial, and industrial clients throughout their service area. Action offers a full range of pest and termite control solutions for individual homeowners, large industrial facilities, and everything in between. 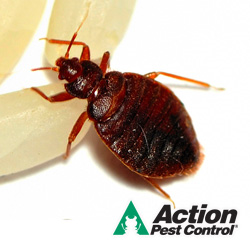 For more information about Action Pest Control, visit http://www.actionpest.com.